My Ads Are Not Showing On Google - Why? My Ads aren’t showing on Google. 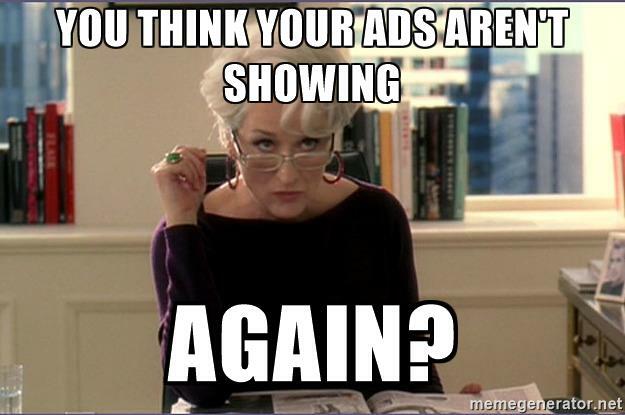 One of the most common questions I hear from clients is “I’ve been looking and my Ads aren’t showing on Google”. My first thought is “well here we go again”, don’t worry though I'm old and cynical but I’ll get over it. Let’s be clear, I completely understand WHY clients search Google for their own Ads. They want to be sure they are working. But at the same time there are a number of genuine reasons why those Ads are showing, but just NOT showing to the client. The client regularly searches for their own Ads and or organic links. They never click on the Ads - they’d be a bit silly if they did! So, after a while, Google decides they are not interested in Ads from that company (i.e. their own) and stops serving them to that individual. Very few accounts serve their Ads to every search ALL of the time. To check, find the Dimensions tab and look at the Search Lost Rank and Budget. In fact, if you are serving Ads 100% of the time you probably need some help with optimisation – give me a call and I'll explain why. Don’t forget that not all Ads are running all of the time in every location. So if you are checking Ads at 9:40pm during a particularly dull episode of Grand Designs, they may well be turned off. Generally, a client (in my experience) checks their Ads against a maximum of three or four favourite search phrases. Meanwhile the account is serving Ads to thousands of different search queries each month. Around 15% of Google searches each month are unique so guessing them gets difficult. Matching queries in Search based campaigns may be manageable, but in Shopping campaigns it is much harder. One client’s data we looked at showed over 14,500 unique searches in a month triggering Google Shopping Ads. So, testing against a handful of searches is always going to be hit and miss. Of course clients are always going to ask this question. It’s their Advertising budget and they want to see where it has gone and is working. We always double check when asked, after all it’s just possible that someone didn’t pay the bill or we broke something and they really are not showing.